Silverswift is designed for comfort, allowing guests to have the best day possible exploring the Great Barrier Reef! Leaving from Cairns, you'll enjoy a swift ride out to the Great Barrier Reef, to explore the world's most precious underwater sights. For over five hours, you'll get to enjoy snorkelling or diving at three unique locations, including Thetford, Milln, Flynn and/or Pellowe Reefs, where divers can enjoy up to three dives, and snorkellers cans enjoy as much time as they want in the water. Known as the quickest dive trip to learn from Cairns to the Outer Reef, we welcome all types of adventurers, including certified divers, intro divers and snorkellers. Silverswift gives you plenty of time to play at the reef. Take the time to learn how to scuba dive with an intro dive, or enjoy the freedom of diving as a certified diver, or spend your day at the surface as a snorkeller - Silverswift gives you the freedom to enjoy the reef the way you'd like! 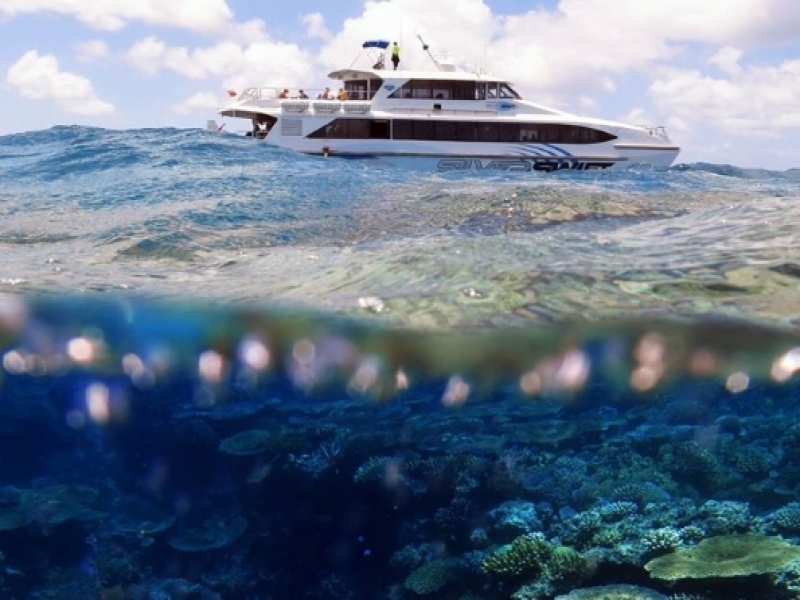 Guests can enjoy a full day of snorkelling on board Silverswift, with a snorkel brief provided at each site, as well as guided snorkel tours around the reefs themselves. This gives guests the chance to explore the reefs up close in the shallow coral gardens and witness is diverse beauty up close. All equipment is provided, with prescription masks available if necessary. You can enjoy the freedom of swimming around at your own pace with your family or friends, or follow our guide around for an in depth tour! Intro divers can enjoy up to two dives during their day on Silverswift. Our qualified and fun team will brief you on what's to come, while quizzing you, showing you videos and making sureyou know the ropes before going on your first dive. Scaling depths up to 12 metres, you'll get to see the reef as you never have before, with everything close and within reach! Certified divers can do up to three dives, where they can explore the reef up close for themselves. All dives will be accompanied by a member of our team, free to charge to ensure everyone has a fun and safe time under the water! With thousands of species to see, diving on the Great Barrier Reef is a divers paradise. The warm waters, amazing bommies, wonderful fish and amazing marine life will keep you entertained as you make your way around the reef. 8:30am Depart Cairns Reef Fleet Terminal for the Outer Reef. On the outward journey, certified and introductory dive briefings begin. 9:50am Arrive at first reef location. Divers gear up, while snorkellers' site briefing begins. Get ready to view the beauty of this natural wonder! 11:15am Silverswift departs for second reef location. Option for introductory divers and certified divers to do a second dive. Snorkellers site briefing. 1:40pm Silverswift departs for third reef location. Snorkellers are once again briefed as to the best areas to snorkel. Option for certified divers to do a third dive or second introductory dive. Credit card for additional dives. $6.50pp payable on check-in include $3.50 Government Environmental Management Charge and Admin Charges. This charge is payable direct by passengers to Silverswift on the day of travel.